This painting by Norman Rockwell, Santa and Expense Book, appeared on the cover of The Saturday Evening Post published December 4, 1920. An alternate title is Santa's Children. This is a perennial favorite of Rockwell collectors of all ages. 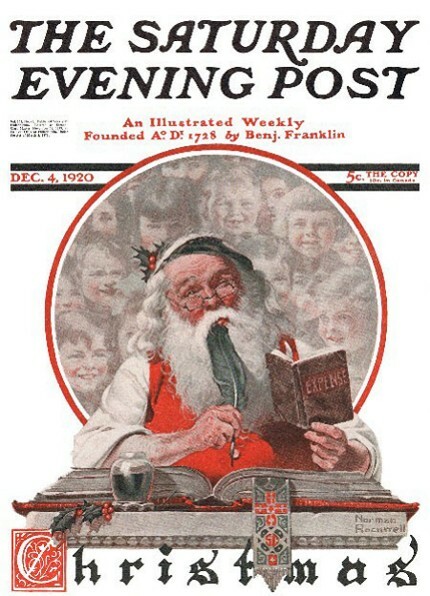 This painting was Rockwell's first picture of Santa Claus featured on the cover of The Post. Rockwell's first Post Christmas cover appeared on December 9, 1916. The original oil on canvas, 22 x 20 inches or 56 x 51 cm, resides in a private collection. and on page 85 of Norman Rockwell, A Definitive Catalogue by Laurie Norton Moffatt. In fact, when thinking of Santa Claus, most people envision him the way Norman Rockwell painted him. And what a bargain at only five cents! Naughty or Nice? Santa Knows! Of course, we presume that this illustration is a real time portrayal of Santa Claus. It is three weeks before Christmas. Santa is checking his list. The good boys and girls would be expenses because they would be getting toys and treats for Christmas. The bad boys and girls would also be expenses because lumps of coal and switches, while cheaper than toys, are not free! Now it's crunch time for getting on the "good" list. Rockwell nicely conveys his message that children are always in Santa's thoughts. Even while he is balancing his ledger, Santa Claus is still envisioning children's smiling faces and thinking about making them happy. Or is the background actually portraying Santa daydreaming while he finishes his bookkeeping? Could imagining children's smiles be how Santa unwinds? Thankfully, Norman Rockwell didn't answer these questions, so the interpretation is still up to the viewer. One of the many intricate and thought-provoking details in this painting is Santa's bookmark. Notice the monogram, SC, on the bookmark. Also notice the crease about one third of the way down, where it hangs over the edge of the book. Santa and Expense Book was only one of 322 Norman Rockwell Saturday Evening Post covers; Here is the list of Norman Rockwell Saturday Evening Post cover illustrations. And, of course, Christmas Red and Green are also Santa's favorite colors. Attention to detail has always been a Norman Rockwell trademark.